Music is an essential part of a child’s development and can help a child learn and use his imagination in ways only he is capable of doing. 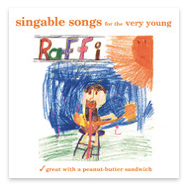 These iTunes albums are perfect for your toddler or preschooler’s growing mind and body. 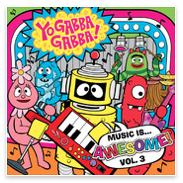 You can’t go wrong with Yo Gabba Gabba! If you have a child more than a year old, you’ve probably been sucked into these colorful characters that teach children the importance of sharing, caring and why it’s important to not bite your friends. With songs mixed in from The Killers, Devo, The Postmarks, Taking Back Sunday and more, it’s a nice balance between kid songs and kid-friendly songs that are easy on parents’ ears. With 12 gentle instrumental melodies by Fred Mollin, this album will soothe and calm the entire family. 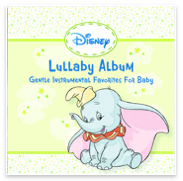 These beautiful lullabies offer a mixture of Disney favorites with classic lullabies and will help children wind down from a busy day or help toddlers drift off to dreamland. 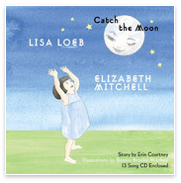 The whimsical songs on the Catch the Moon album are pitched exclusively for toddler’s ears — but kids of all ages will enjoy these enchanting songs. The acoustic sounds with a folk/country spin make these tunes perfect for car rides, quiet playtime and help also encourage the use of imagination. 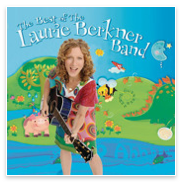 Get up and run, jump, dance and play with these infectious songs by The Laurie Berkner Band. These fun children’s folk-pop tunes tell stories and encourage children’s imagination and creativity while singing about their favorite things – dinosaurs, rocket ships and play, to name a few. 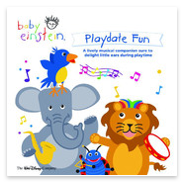 This made-for-playtime album incorporates the stylings that we’ve all come to know and love from the Baby Einstein symphony with the upbeat and classic children’s songs that we all grew up singing. Sing, dance and play along to tunes like If You’re Happy and You Know it and The Wheels on the Bus with your children… and have fun!